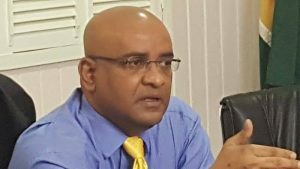 General Secretary of the Opposition People’s Progressive Party (PPP), Bharrat Jagdeo on Monday refused to say whether he would be interested in running again as his party’s presidential candidate, but he identified several qualities the candidate should possess. “I don’t have to give yes or no answers. I just told you what is preoccupying my mind now. Whether that time comes then you will hear from me whether I am interested or not,” he told a news conference at Freedom House. Touching on utterances by staunch PPP opponents that the recent Court of Appeal ruling against presidential term limits without a referendum has helped to position him to be his party’ next presidential candidate, Jagdeo said even those detractors were seeking to select the “best candidate.” “Frankly speaking, I am so surprised that there is such a big outcry about Jagdeo and all of this because I am supposed to be a dictator, I am supposed to mismanage the economy, I am supposed to be the most corrupt individual in Guyana. Therefore, I’ll make a terrible candidate…,” he said. Recalling that it was he, who had signed the constitutional amendment into law to provide for term limits, he said the PPP would eventually decide on who would lead that party into general elections constitutionally due in 2020 by examining the attributes of all the presidential hopefuls. He listed the qualities of the PPP’s presidential candidate: “A candidate who can lead us to victory, a competent candidate who can deliver on promises, a candidate who is visionary, a candidate who can bring people together so at that point in time when we decide on our candidate, we in the People’s Progressive Party, we will look at all the attributes of the presidential hopefuls and then a decision willo be made,” he said. Jagdeo said, now that he is at the helm of the party, he was busy fixing some of the PPP’s failures, mobilizing its traditional East Indian support base- mainly sugar workers and rice farmers- , Amerindians and non-traditional support Afro-Guyanese supporters. He said the party was also busy targeting business-owners, middle class, intellectuals and professionals. “The PPP has made no decision about who its presidential candidate will be in the next elections. This will be decided at the appropriate tike but I can promise you that it will done democratically like we did with our Congress and our General Secretary,” he added. The Opposition Leader cited the need for the PPP to incubate new leaders who are efficient. “This party has no room for arrogance. We have accepted all our faults in the past,” he said. Attorney General Basil Williams says government will appeal the split decision that upholds a High Court ruling against parliamentary amendment of Guyana’s constitution to provide for presidential term limits without a referendum. Chancellor of the Judiciary, Carl Singh and Justice B.S. Roy ruled in favour of upholding the decision by then Chief Justice Ian Chang. Current Chief Justice, Yonette Cummings-Edwards dissented, saying the people have vested that right in elected officials of Parliament and Local Government.